If you go through my ever expanding wardrobe, you will see a clear difference in my winter and summer wardrobe. Even though I live in Spain and I can wear a lot of my clothing all year round with the help of some tights and a cardigan, you do see a change in colourpalette for my winter items. More greens, browns, blues and rich Autumn colours. 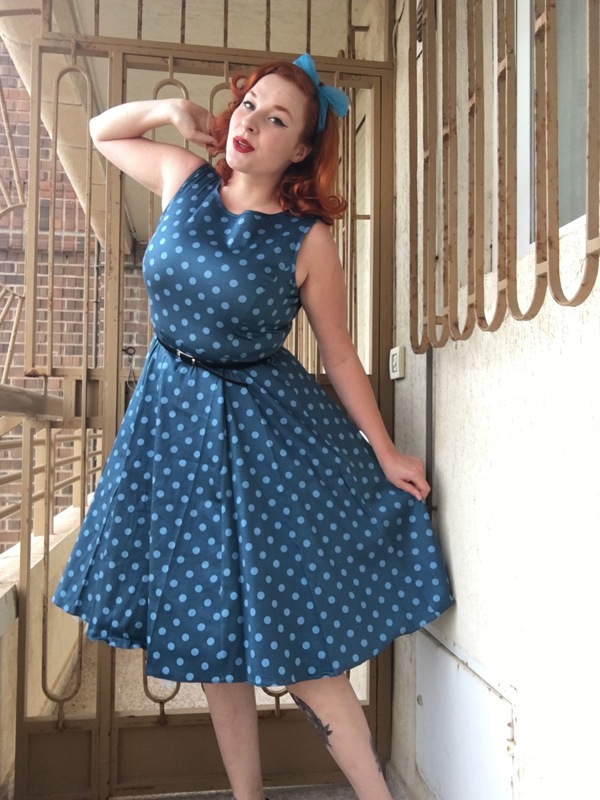 So when Lady Vintage offered a Hepburn Dress to review I knew this polkadot beauty would be a great addition to add some cooler tones to my collection. Lady Vintage is one of those brands that has really made an amazing development in their designs and quality! 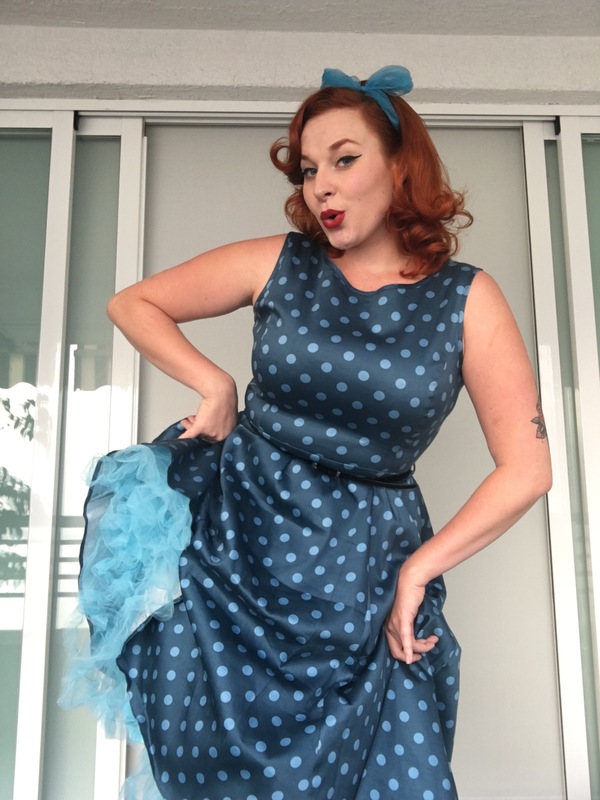 What I absolutely love is that they offer dresses in size 8-28 and they have an exclusive plus size clothing line that runs from 16-32, Lady Volup, in collaboration with the amazing Georgina Horne from www.fullerfigurefullerbust.com. Lady V produces their clothing in London, are affordable and ship worldwide. The Audrey dress is one of Lady V’s classic styles, of course inspired by the lovely Audrey Hepburn. The Niagra dress is made out of a lovely cotton sateen fabric that gives some stretch. 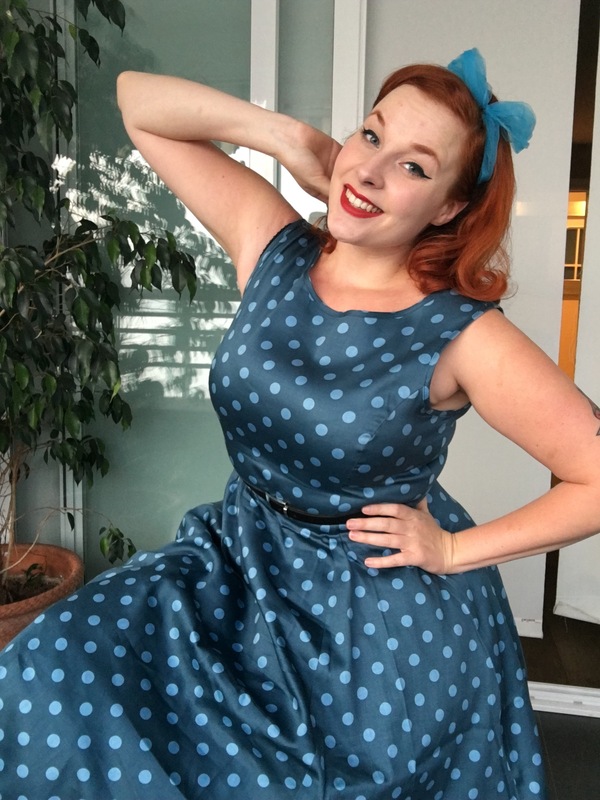 The lovely contrast of the iceblue polkadots against the soft indigo blue paired with the little sateen belt is just stunning. The cut of the Audrey dress is so very flattering due to the high neckline and fitted waist accentuated by the thin suede belt. The fabric is a shiny cotton sateen that is thicker than your average cotton and stretches in all the right places. The dress in my case falls just over the knee, but I am quite tall at 1.80m. I styled the Hepburn dress with a vintage hairscarf and a light blue petticoat but the dress looks amazing with or without a petticoat. The Audrey dress comes in many different prints and colours and retails for £50. Make sure to grab yours whilst stock lasts! Really beautiful colour on you!